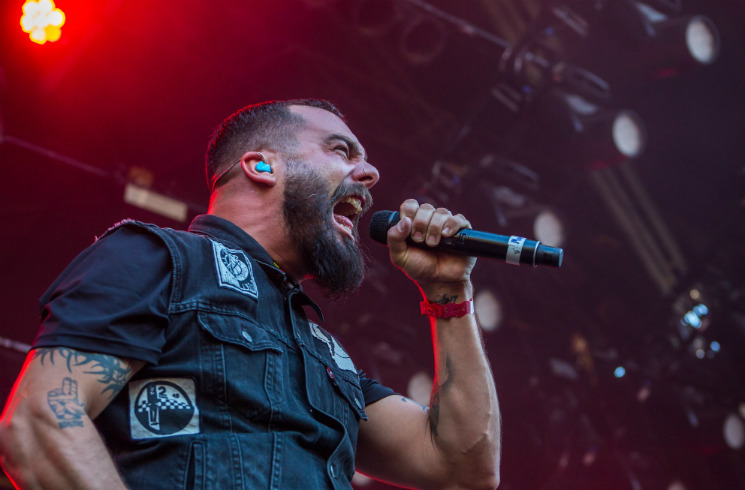 Melodic yet hard-hitting metalcore troupe Killswitch Engage stormed the Heavy Stage at Heavy Montreal on Sunday (August 7) to power through an action-packed 50-minute set. The band opened with "My Curse," from their 2006 effort As Daylight Dies, as if to immediately reinforce how easily frontman Jess Leach could handle the vocals of former singer Howard Jones. As the band are touring in support of their latest album, 2016's Incarnate, the five-piece ripped through a number of new tracks, and the title track, "Hate by Design" and "Strength of the Mind" were particularly excellent selections. When the new material gets heavy, it's some of the heaviest Killswitch Engage we've heard to date, and it resonated extremely well live. The band wove their way through myriad selections from their seven-album catalogue, making the performance feel like a greatest hits parade. "My Last Serenade," from their 2002 effort Alive or Just Breathing, was seething with energy, and the galloping rendition of "In Due Time" from 2012's Disarm the Descent was excellent. Much to the howling delight of the thousands in attendance, the band closed with their epic cover of Ronnie James Dio's "Holy Diver."